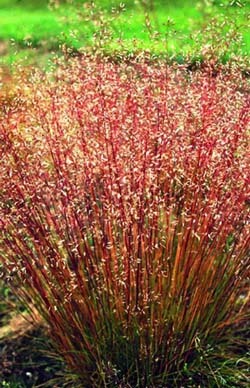 Perennial, forming 30-70 cm high, dense to light thickets, rhizomes, numerous intravaginal young shoots. Culms are 20-60 cm high, thin, erect or geniculate, shiny, smooth and glabrous. The plant is one to three-noded, nodes glabrous and grooved. Leaf sheaths grooved, smooth and glabrous, only apically scabrous, basal ones thin and disintegrating into parallel fibres. Ligule is a 1-mm long, membranous fringe, broadly rounded at the apical end. Leaf blades up to 20 cm long, 0.3-0.8 mm in diameter, bristly, pointed, smooth and glabrous, only apically scabrous, hexagonal in cross-section. Inflorescence a panicle, 4-15 cm long, up to 8 cm broad, open, expanding, outline broadly ovate. Lateral branches ramifying in pairs off glabrous main axis, expanding, up to 8 cm long, not branched in lower third, squarrosely branched above, mostly meandering, filiform and scabrous as the 3-10 mm long rachis. 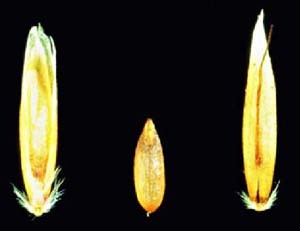 Spikelets are twoflowered, 4-6 mm long, light brown, often coated purple or shining silver, seldom growing to foliage shoots. This plant occurs worldwide and in the Alps it grows in the foothills and the montane, alpine and subalpine zones. In the foothills and montane zones it needs shade and therefore grows mainly in forests. In the high montane and subalpine zones it tolerates or requires full exposure. There it occurs in glades, meadows and dwarf shrub heaths. The species is sensitive to airdeficiency in soils. Its natural habitats in Europe are generally nutrient-deficient. The type of soil is usually fustyhumus brown soil, sandy to loamy brown soil, podsol brown soil, podsols or desiccated peat. The plants grows on soils with a pH between 4 and 7, although a pH of 3.3-3.5 is sometimes tolerated. In the Alps it grows up to 2 750 m above sea level. Important grass for soil with fine-earth deficiency and humus, acidic, arid sites above the timber line as well as halfshaded forest aisles and slopes in lower altitudes. It prefers nutrient-deficient soil and is sensitive to foraging. Fruit of the husk 25-35 mm long, 0.6-0.9 mm wide, 0.5-0.8 mm thick, ovatelanceolate. Awn meandering, auburn, slightly longer than lemma, growing from above the base. Lemma membranous, silvery translucent, longer than fruit, lemma transcending margins of palea. Palea flat, in narrow hollow, flimsy. Base with few white hairs. Stipellus short with few but long hairs. Surface tawny to brownish matt. Fruit 2-3 mm long, 0.5-0.7 mm wide, 0.5-0.6 mm thick, oblong, brown, matt. Thousand seed weight: 0.5-0.7 g.
This species prefers arid or moist sites up to 1 000 m above sea level. Compact and air-deficient soils should be avoided. Soils should be water permeable and rich in humus. In the literature there are reports of growth disorders and chlorosis when the pH of the soil is above 6. However, in cultivation experiments on soils with pH 7 this was not the case. On arid sites irrigation is recommended in order to facilitate a regular water supply. Wavy hair grass is, however, sensitive to waterlogged soil and soil that is blocked by alluvial deposits, especially in its juvenile development. Wavy hair grass should preferably be sown in spring with broadcast sowing no deeper than 0.5 cm. Cultivation below winter barley is not recommended because the species has a slow juvenile development. Satisfactory development of single plants until autumn will therefore not be possible. Seed flow is sufficient for common seeding systems. A light cover crop population is important because of slow juvenile development. Summer barley and linseed have proved worthwhile in practice. Row spacing: for this species, row spacing should be between 12 and 15 cm. Broadcast seeding is possible. Phosphorus and potassium: wavy hair grass prefers nutrient-deficient soils. For an intermediate supply of phosphorus and potassium additional fertilization is not necessary. In autumn small amounts of manure can be applied without risk. Nitrogen: this too should only be applied in small amounts. A moderate application of nitrogen in autumn and/or in early spring (no more than 20-40 kg/N each, depending on climate) facilitates a good yield. On soils with a pH higher than 6, chlorosis may occur; the application of ferruginous fertilizers (not as sulphate) will then be necessary. Because of slow juvenile development, intensive maintenance is necessary and weed control has to be carried out in the weeks after harvesting the cover crop. Wavy hair grass does not grow very high in the summer of cultivation (0.5-1.5 cm) and easily risks being covered by crop residues. Therefore straw has to be removed immediately. Chaffing and spreading crop residues lead to plant losses on large areas. As for most grasses the following guidelines apply. Before sowing, only contact herbicides should be used, up to three days before the beginning of sowing. Hormone-type and broadspectrum herbicides should generally not be used until the species has reached the three leaf stage. It should be noted that the herbicides listed in Table 3 are not registered for use in seed cultivation in some countries. The low growth height of this species requires considerable effort in maintenance and weed control. Selective grass weed control is difficult. Because of different growth heights of wavy hair grass and other grasses, selective control with wick and total herbicides (e.g. Glyphosate) is possible within certain periods of the growing season. Shattering tendency: low to intermediate. Ripeness: the axes of the panicles change colour to light tawny. Seeds adhere well to the panicle after ripeness and change colour from greenish-brown to brown. To check ripeness, a bunch of panicles should be dutched firmly: the brown seeds will fall off easily if ripe. Ripening period: last decade of June or first decade of July. Because of the low shattering tendency it is easy to fix the time of threshing. Harvesting techniques: wavy hair grass can easily be threshed directly. The rotational speed of the threshing drum should be set low to avoid mechanical damage or dehusking of seeds. Seed flow is sufficient. Seeds as well as the chaff in the sieve should be checked several times while threshing. Settings of the threshing concave: generally close, the drier the seeds, the wider the setting in order to prevent seed damage. Cleaning of seeds usually presents no problems. Crop yields: crop yields can vary greatly (12-150 kg) where there is little experience in propagation. Where experience is considerable 100-150 kg can be expected. Appropriate prices for seeds are a precondition for economically profitable production. For optimally maintained populations, three harvest years are possible.